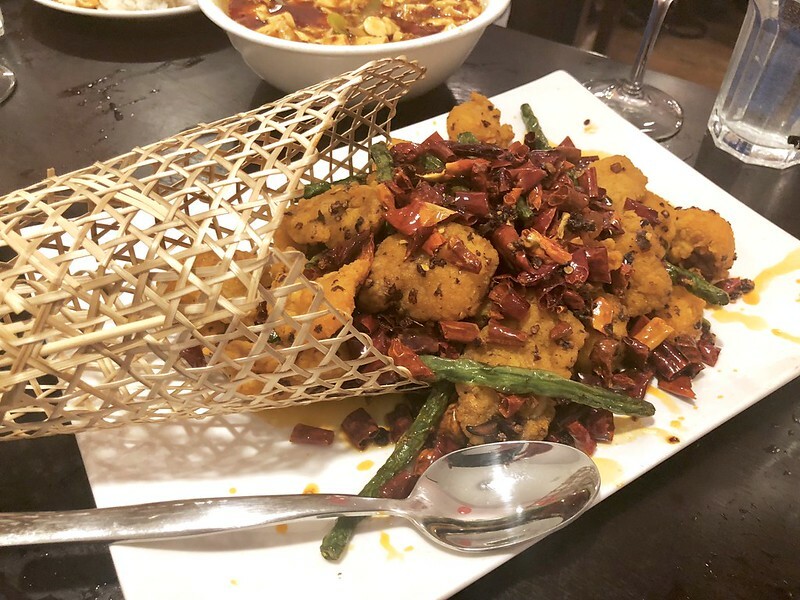 I was driving through downtown Evanston yesterday and noticed a new Asian restaurant 'Peppercorns Kitchen' which is named after Szechuan peppercorns just opened on Davis street not too far from Joy Yee or Lao. 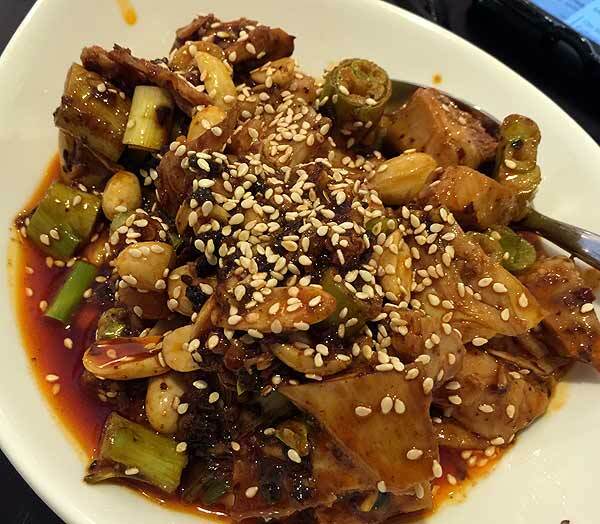 When I got home I checked out there website and menu and found this is szechuan cusine which is rare outside of a few in Chicago (lao sze chuan, Chengdu Impression, Asian Bistro, etc). This restaurant is from a california chain of Asian restaurants called Boiling Point: http://www.bpgroupusa.com/Company.html. From there menu it looks like they also have a version of dry chili chicken (Chongqing Popcorn Chicken). 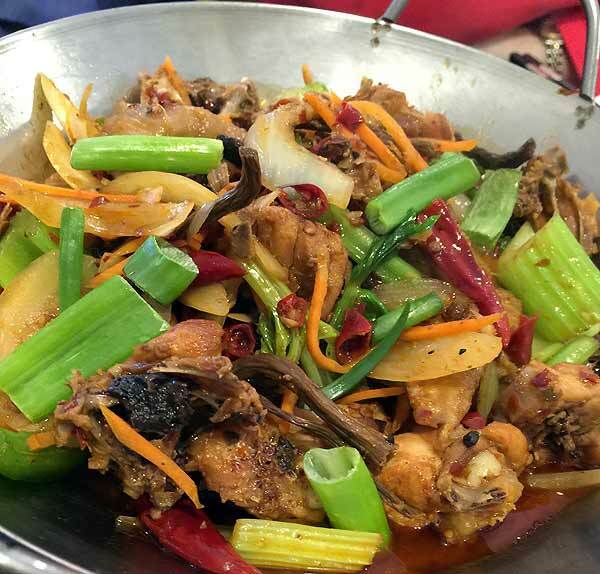 Has anyone had the pleasure yet of trying this new Szechuan restaurant out and what are your thoughts? Last edited by polster on January 28th, 2016, 2:11 pm, edited 4 times in total. Menu looks promising. With Lao Szechuan steadily declining this may be the new hope. Thanks for the heads up! We're going to try it for dinner this week. Will report back. nsxtasy wrote: Thanks for the heads up! We're going to try it for dinner this week. Will report back. Forgive the photo quality, as I left my usual camera in the car. Also forgive the menu choices, some of which I would not have normally chosen. Still, I think we got a good idea of what the food is like, and hopefully the narrative and photos will convey that. If you don't want to read the entire description, the Cliff's Notes version is, I thought it was very good overall, with plenty of dishes to love and enjoy, as well as a few that I'll be avoiding. I look forward to returning and trying other dishes. 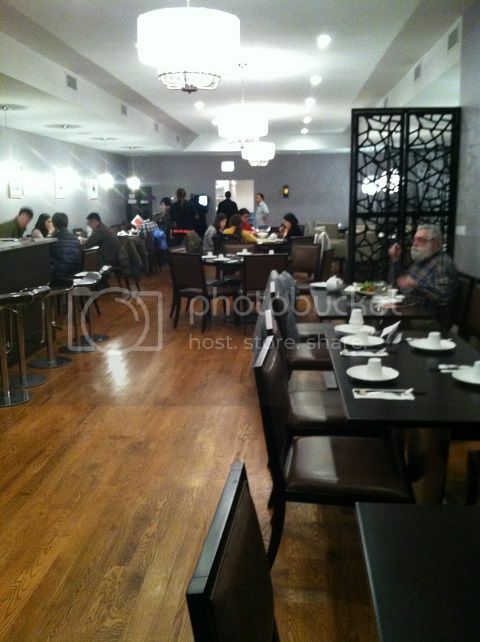 This is a solid addition to Evanston, which IMHO needed a really good Szechuan restaurant. 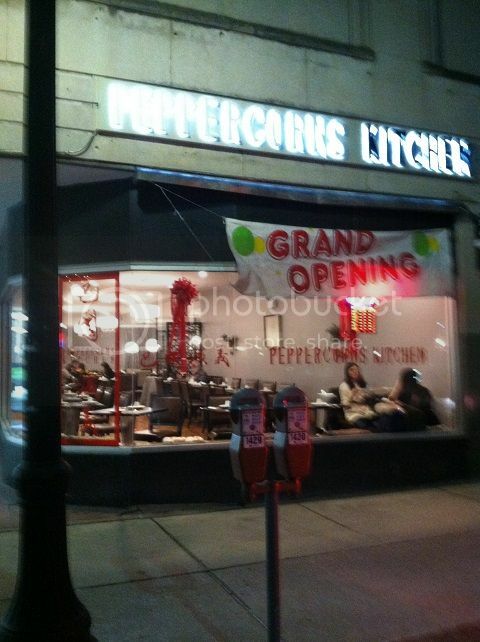 Peppercorns Kitchen is on Davis Street in downtown Evanston, next door to the American Mattress store. We arrived at 6 pm, and as you can see, at that hour most of the tables were empty. By 6:30, almost all the tables were taken, and it didn't start emptying until around 7:30. We didn't have a reservation, and I didn't ask if they take reservations. A server came, and we ordered. When we ordered the first couple of dishes by their names, the server asked us the dish number, so from that point on, we ordered by number. (I'm guessing the restaurant is so new that the servers don't know the menu by heart, the way they will after working there a while.) Spicy dishes are shown on the menu with one, two, or three red dots designating levels of hotness. 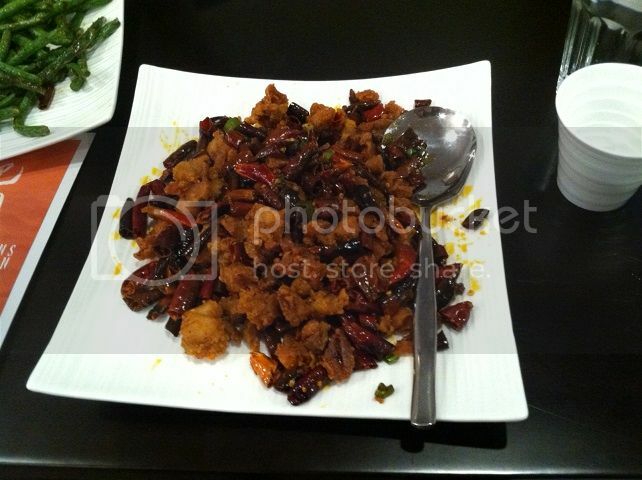 We ordered dishes as is, without specifying anything special regarding ingredients, spiciness, etc. There is no alcohol on the menu, but I think we spotted another table who was doing BYO. Dishes arrived at the table one at a time, which was fine with us. The first two dishes were appetizers. 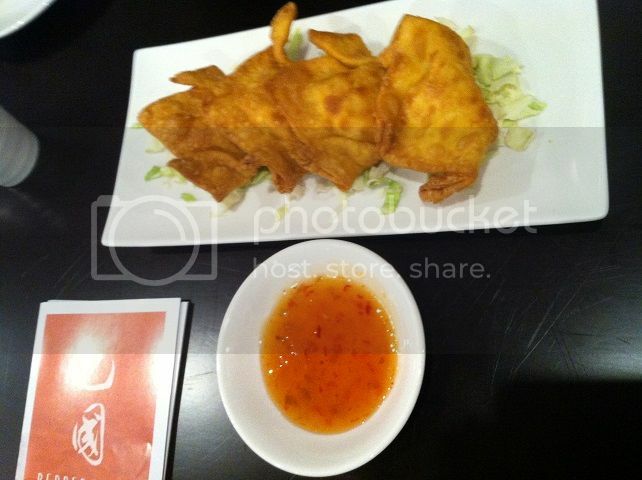 The first was Crab Rangoon (002). This is a dish I rarely order and I'm not even sure how it's supposed to turn out. The fried wonton wrapper was pleasantly crunchy, and the cream cheese filling was smooth and tasty. I didn't notice any crab. I guess it was okay. 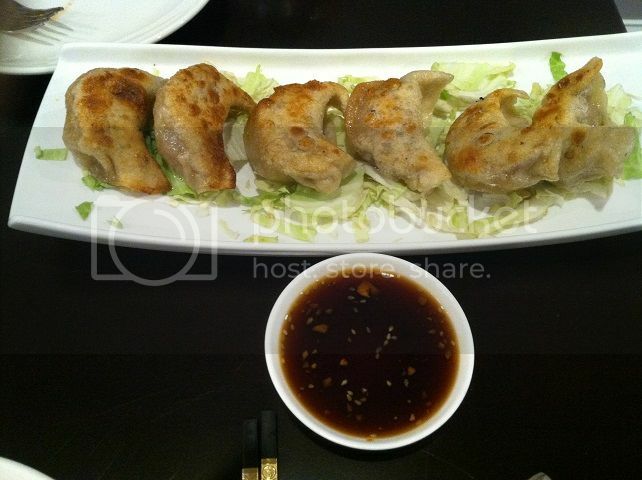 The next dish was Pot Stickers (011). The filling and dipping sauce were decent, but the outer wrapper was overly chewy and doughy. I love really good pot stickers. These weren't awful, but they weren't great either. We ordered three entrees and two vegetable dishes. 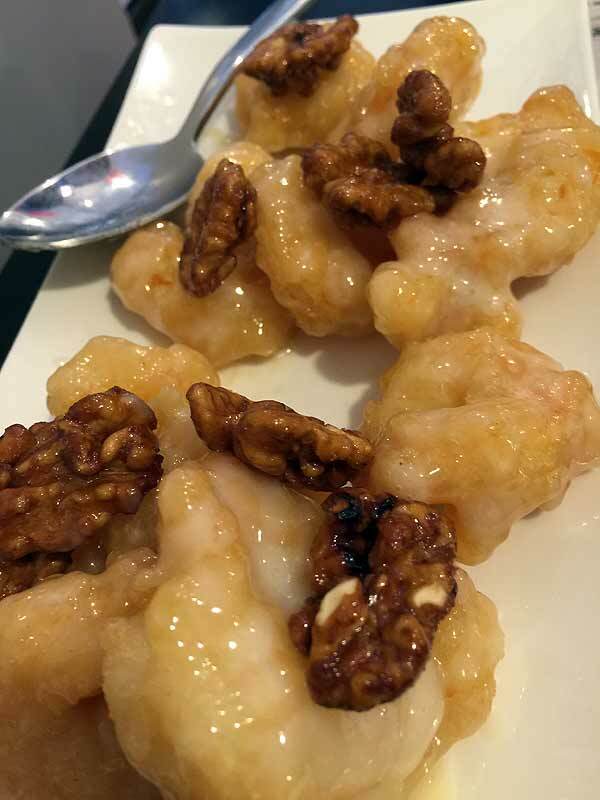 The first of these to arrive was the Walnut Shrimp (062), which is a mild dish (no red dots) and was in the Chef's Special section of the menu. This was the best dish of the entire meal, with tender, moist shrimp in a mayonnaise sauce with candied walnuts. It's similar (or identical) to the dish at Lao Sze Chuan called Mayonnaise Shrimp. The Peppercorns version is as good or better. A standout, and one we will definitely order again. This was followed by the Chongqing Popcorn Chicken (068). 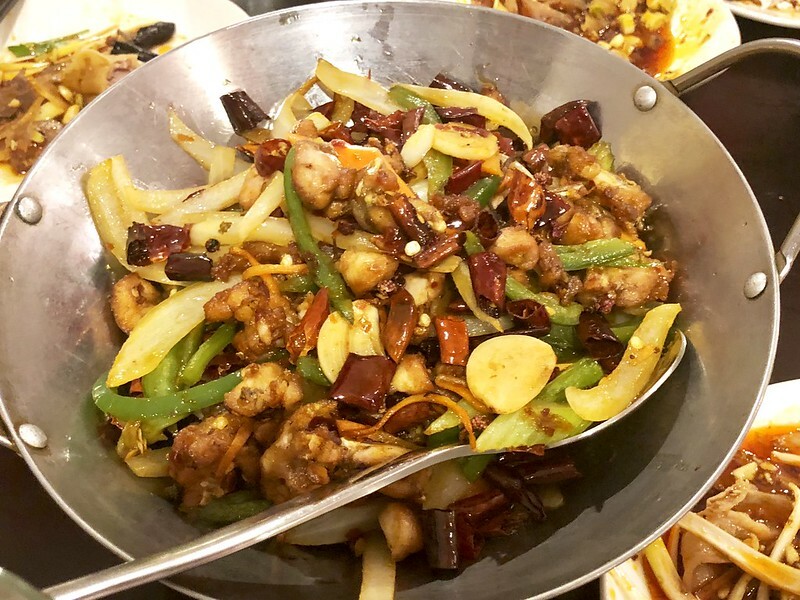 Polster's guess was correct; this dish is the same as the dry chili chicken dish popular at many other Szechuan restaurants. The three-dot level of hotness shown on the menu was accurate - great for those who like their food REALLY spicy, but maybe too much for a lot of folks. 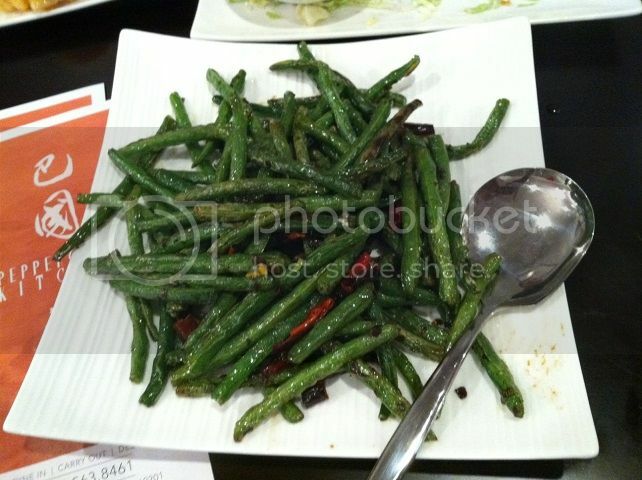 I thought this version was very good, and better than at Lao Sze Chuan, where it is often excessively oily. This dish is a great choice for those who enjoy spicy food. 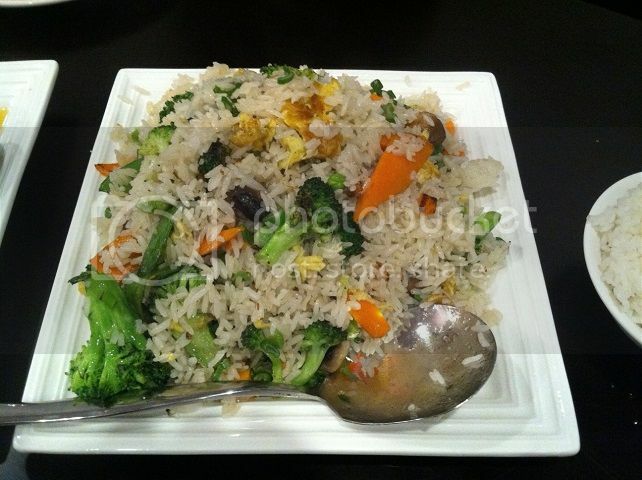 The next dish was Fried Rice with vegetables (183). 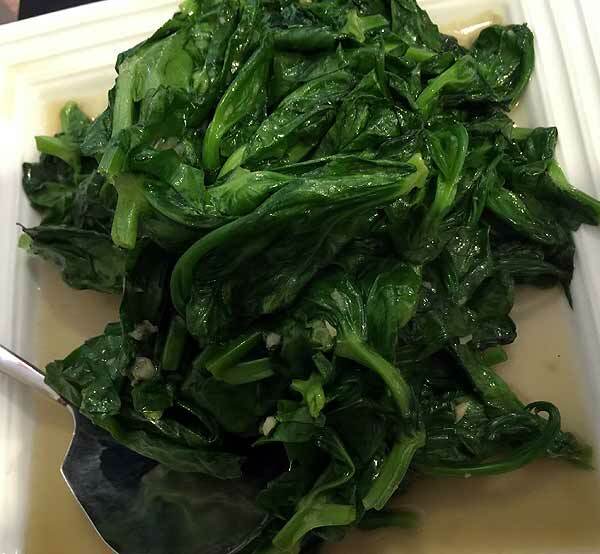 I thought this was really bland, but I think the restaurant messed this dish up. Before they brought this dish and the next, they asked if we wanted anything else. Apparently they had forgotten two of the dishes we ordered. Then they brought us a dish of fried rice with beef, which was not what we ordered. The fried rice with vegetables looked like white rice with vegetables in it, not like the more typical looking fried rice in the fried rice with beef that they brought in error. I think they did a quick hack job on this dish so they could bring it out quickly. Our final savory dish was Kung Pao Shrimp (098), with its one dot of hotness, again accurately described. It was a very good version, although this too is not a dish I customarily order. Desserts seemed a bit pricy (four of the five desserts were $6.95-8.95) and then we found out why. We ordered one of the Tapioca with Mango & Coconut Sauce (197, $6.95). I was expecting a small bowl of this dessert. What arrived at the table was tureen-sized, with at least a quart of dessert. It was mostly a rather thin liquid with small pearls of tapioca and small bits of fruit in it. It reminded me of bubble tea, but with small pearls of tapioca rather than the large ones you normally see in that beverage. I thought this was terrific. Service was friendly and helpful, but when they were slammed (6:30-7:30, as mentioned above) it took a little while until the server checked back with us so we could order dessert and then get the check. I chalk that up to the fact that they're brand new and are still figuring out how to staff to handle what is clearly a lot of business at the peak dinner hour on a weekday, so for right now I'd cut them slack on that. All in all, I was very pleased with our dinner at Peppercorns Kitchen. I think it is highly likely to become part of our regular rotation, our go-to place for Chinese. Welcome to Evanston! Last edited by nsxtasy on January 27th, 2016, 10:10 am, edited 2 times in total. Thanks nsxtasy for your full review with pictures included. How would you compare overall the food to the other Szechuan restaurants like Chengdu Impression, Yan Bang Cai, Asian Bistro, other LAO restaurants, etc? 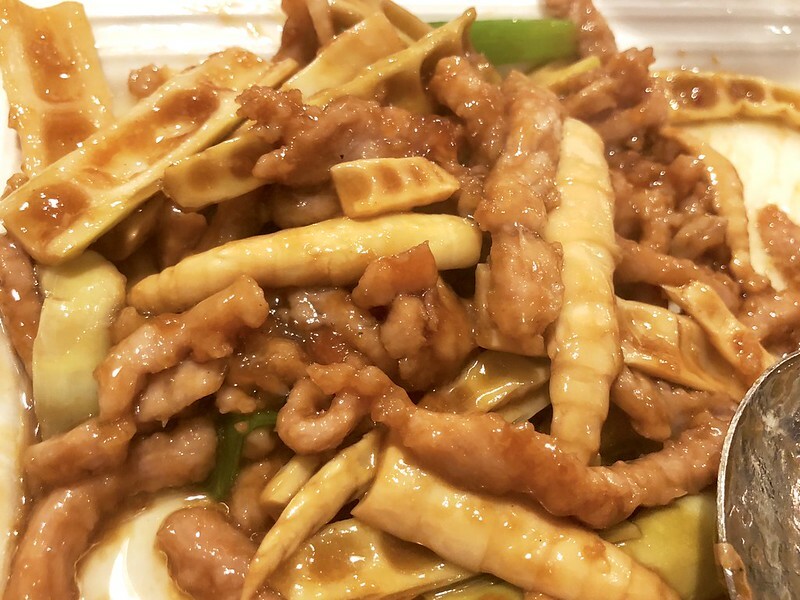 Also it looks like you ordered a lot of items that are offered in most Chinese restaurants here in Chicago (Crab Rangoon, Pot Stickers, Walnut Shrimp, Fried Rice, Kung Pao). I would suggest trying some items that you haven't tried before that might be unique to only Szechuan cuisine in the future to expand your palate and to try something new. Thanks again for your review. I hope to try this restaurant in the coming weeks. 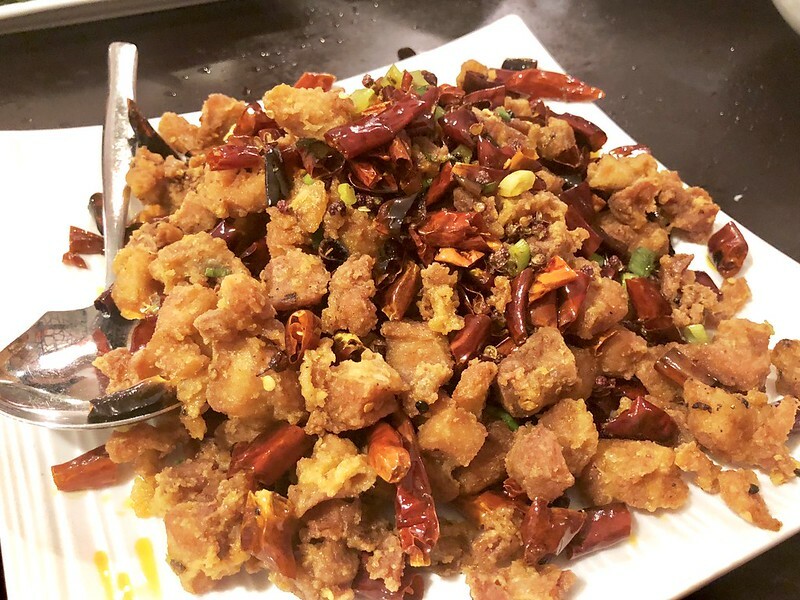 polster wrote: How would you compare overall the food to the other Szechuan restaurants like Chengdu Impression, Yan Bang Cai, Asian Bistro, other LAO restaurants, etc? 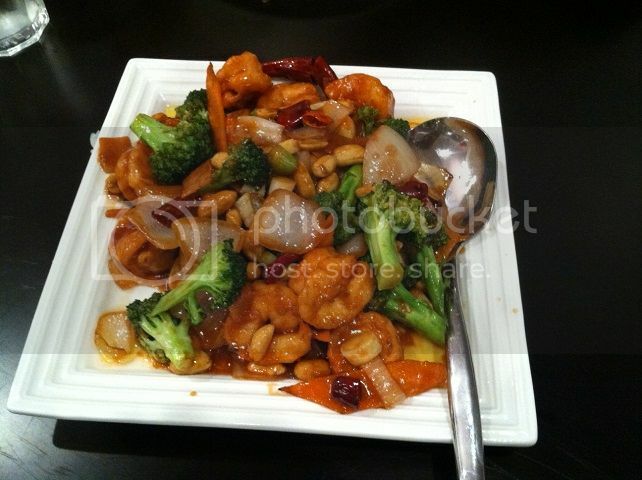 We ate at Chengdu Impression a month ago and liked it a lot. I have a very similar impression there as at Peppercorns. They are both capable of turning out some really delicious food. But we didn't order well, i.e. we tried some dishes that we didn't like, that we would avoid in the future. 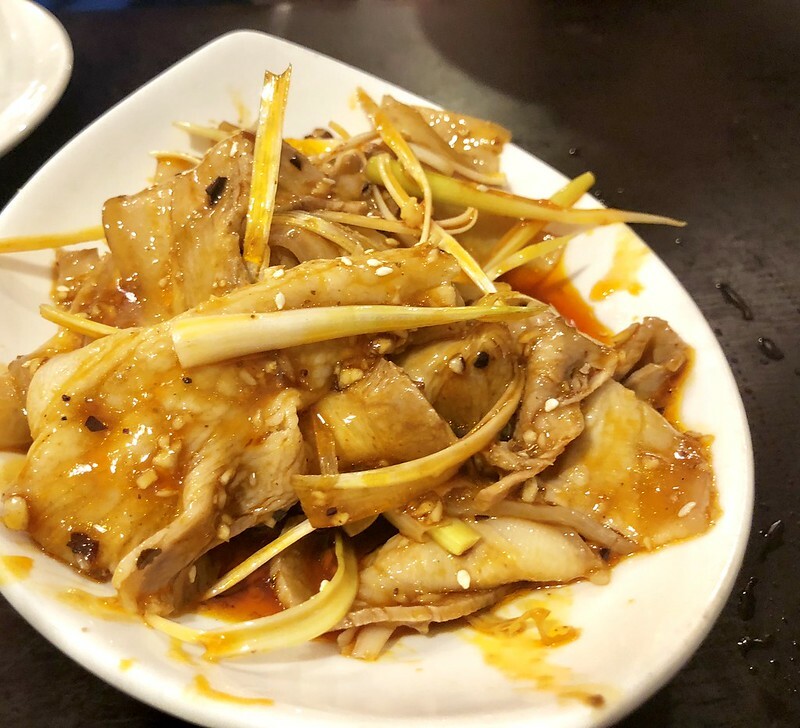 At Chengdu, we ordered several dishes that were too similar to each other, and next time will order more variety of preparations and flavor profiles. At Peppercorns, we were accompanied by a non-meat-eating family member who ordered bland, American-ized dishes that skewed the meal that way. Based on only one visit to each, I think they are both worth exploring further. We're more likely to do so at Peppercorns than Chengdu due to geographical convenience to us. (Before we knew about Peppercorns, we were expecting Chengdu to be our go-to place for Chinese.) We've also enjoyed several visits to 8000 Miles in Roselle, owned by Ben Li of the former Double Li in Chinatown. 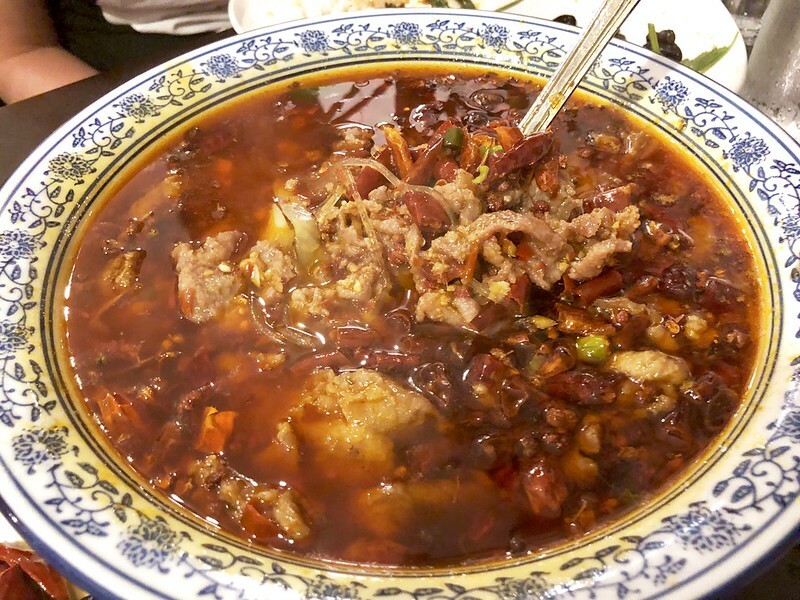 It too is a place where you can find some truly excellent Szechuan fare. All three of these are very good indeed, and I would have a tough time deciding which of these is the best, especially with only one visit (with poor choices) at two of the three. 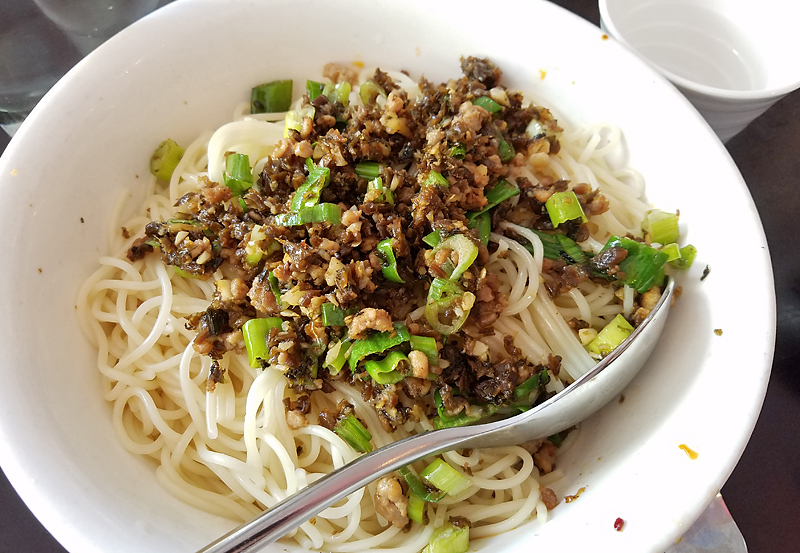 We have had meals at three locations of Lao Sze Chuan, as well as one of the other Tony Hu restaurants, and we liked both Peppercorns and Chengdu better. 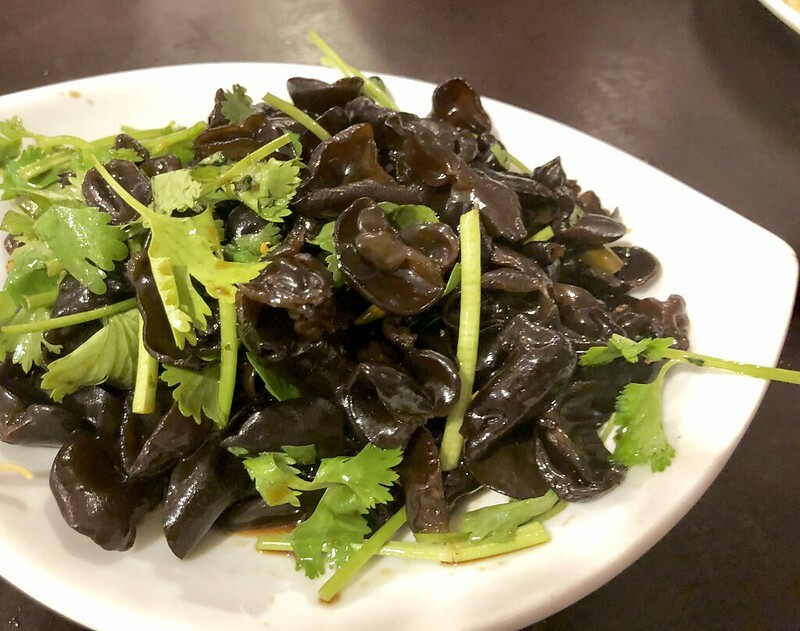 We had been disappointed at the former, due to excessive oil in many of the dishes, and single-note flavoring (hot pepper overwhelming the other ingredients). polster wrote: Also it looks like you ordered a lot of items that are offered in most Chinese restaurants here in Chicago (Crab Rangoon, Pot Stickers, Walnut Shrimp, Fried Rice, Kung Pao). I would suggest trying some items that you haven't tried before that might be unique to only Szechuan cuisine in the future to expand your palate and to try something new. As noted above, we were accompanied by a family member who was responsible for ordering most of those dishes, which I would not have ordered. (I had to bite my tongue when I was thinking, "Crab Rangoon? Seriously?" ) That being said, I've been with groups who ordered some of the more exotic dishes, and I have not been fond of some of them, with overly chewy maw and tendons and such. I enjoy some more unusual meat items, such as organ meats, but some of those I've had at Chinese restaurants, not so much. Another factor in our ordering is that we were limiting the number of meat dishes, due to that family member. It's worth noting that much of the Peppercorns menu, including almost all of the Chef's Special section, is meat-centric. There are vegetarian and seafood dishes elsewhere on the menu, but they are of the less adventurous type. And the Walnut Shrimp was exceptional, and should not be dissed. Thanks nsxtasy for your concise reply and clarification on why certain items were ordered in your initial visit to Peppercorns Kitchen. Cheers and enjoy your future outings at Peppercorns Kitchen. The Pork Lip with Chili Pepper appetizer was one of the standout dishes of the afternoon. Served chilled, the lips had a nice, subtle chew to them, with just a hint of spiciness. Yam Potato with Blueberry Sauce was unusual - cool bland yam (we thought it was a true yam, not the type of sweet potato that's occasionally misidentified as a yam) inexplicably married with blueberry jam. It was probably the least favorite dish of the afternoon. 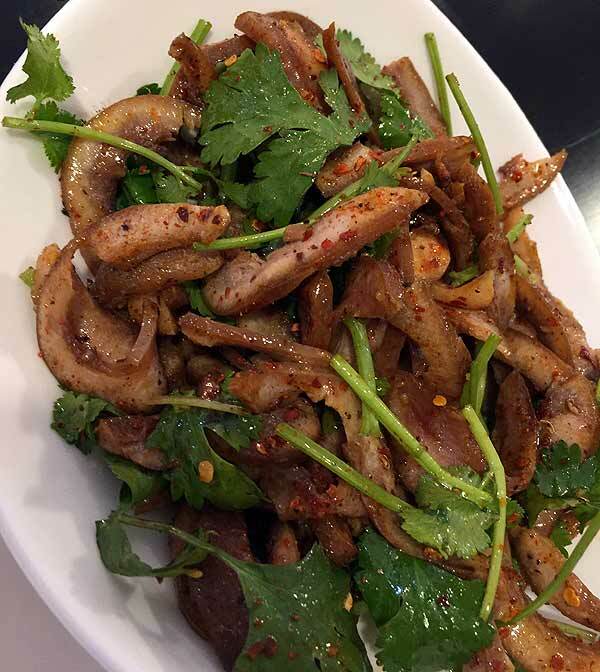 Our final cold appetizer was Spicy Diced Rabbit. As many noted, the bones included in the rabbit probably made it a more traditional dish, as would be served in China. While it wasn't especially easy to eat, the bits of rabbit you could coax off the bones were quite flavorful. Orange Beef was maybe half a step above what you'd get at a typical Amer-Chinese hole in the wall. We tried two "dry pot" dishes. The first, Dry Pot Cage Free Chicken, was another slightly bony dish (not that that's a bad thing). It was a bit spicy, but the vegetables rounded it out well. 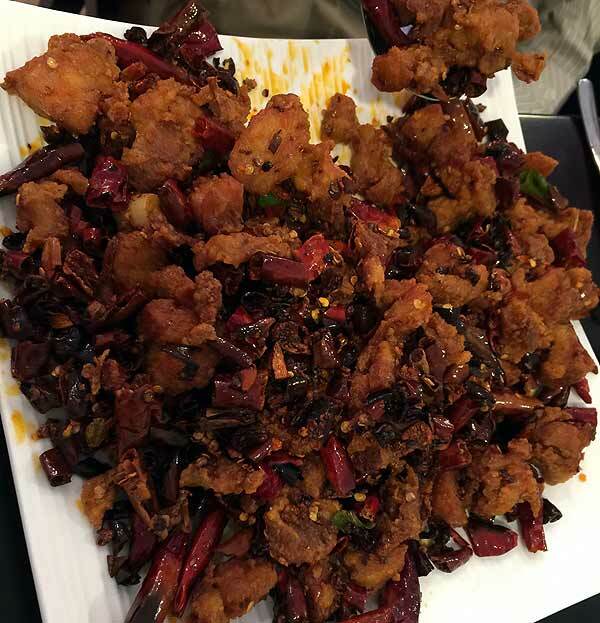 Our other chicken dish, Chongqing Popcorn Chicken, was boneless, with small pieces of breaded and fried chicken strewn among many pieces of hot red peppers. Spicy and delicious. On the other hand, Walnut Shrimp was mild, but highlighted the lightly floured and fried shrimp well. I'm not a big fan of tofu, but the Mapo Tofu with Ground Pork did a nice job of soaking up the sauce for some definite flavor. Our other dry pot dish, Dry Pot Tea Tree Mushroom, was among my favorites. 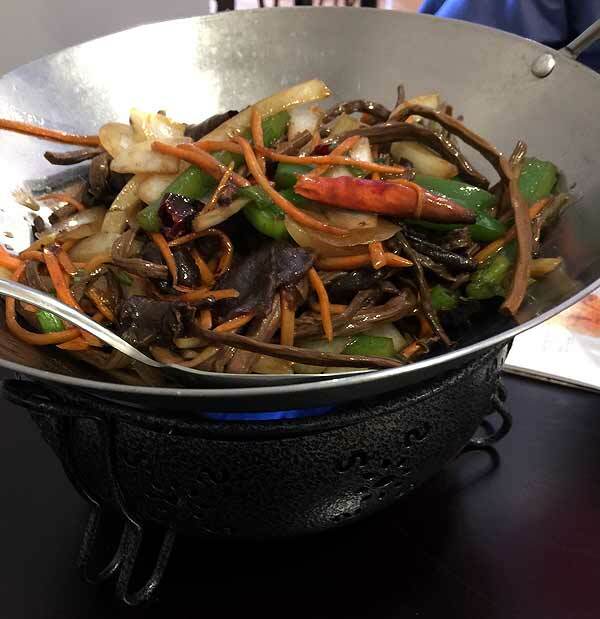 The mushrooms (which I assume were dried and reconstituted) had just the tiniest bit of spiciness, balanced by a good mix of vegetables. A very simple, but well-received dish was Pea Shoot with Garlic. I always like to eat something green. Service was good, it's a nice, fairly large space, and there were probably more people with Asian ancestry than those of us whose ancestors came from other parts of the world. That's a good thing for an Asian restaurant. Peppercorns Kitchen has become my favorite Asian restaurant in Evanston - and there's plenty of competition here. I agree with Tom's assessment (although at least on my computer, I can't see any of the photos). The Pork Lip with Chili Pepper was excellent--slightly spicy, nicely chewy, with cilantro and, I think, sesame oil. I would order this again in a heartbeat. The Dry Pot Tea Tree Mushroom was also delicious with a wonderful smoky flavor. The dry pots are small woks served over a frame with sterno or something like it, so they continue to cook a bit at the table. 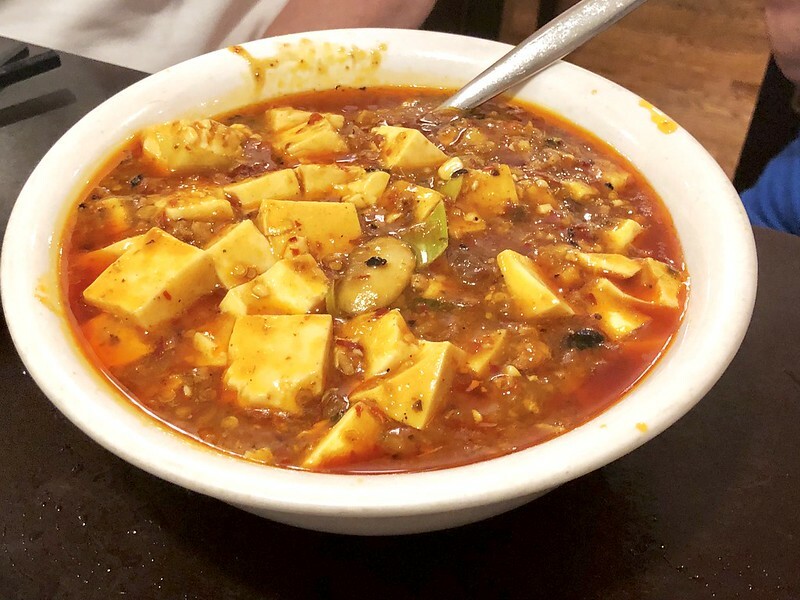 I am a fan of Mapo Tofu and thought Peppercorns' version was first-rate--not amazingly hot, but with that addictive Szechuan pepper burn. I thought Peppercorns' versions of Mapo Tofu and the Walnut Shrimp were better than my last orders of these at LSC in Skokie. I am looking forward to trying more of Peppercorns' large menu, which includes some Korean dishes as well. 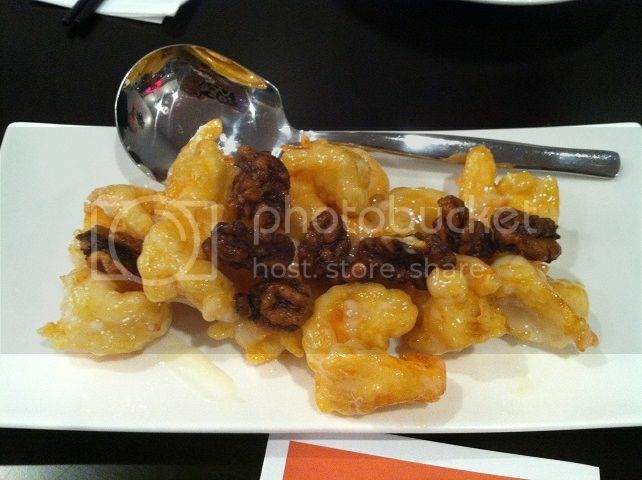 My favorite dishes were the popcorn chicken, the walnut shrimp, and the orange beef. The orange beef, which I had not had here before, was particularly tender, with a lovely crispiness on the outside; see below regarding spice level. I don't like tofu or rabbit. I tried the pork lips, but they didn't wow me. The dry pot chicken had the same issue as the fried short ribs I had on my previous visit - the meat was diced, with small pieces on the bone - lots of bone, not much meat. Ordering note: As mentioned above, all spicy dishes are shown on the menu with one, two, or three dots showing the level of spice (a little, medium, and VERY hot). 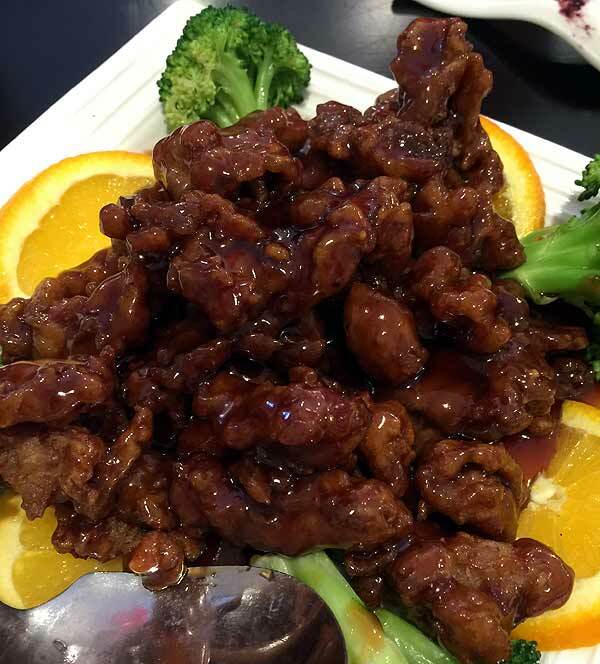 The orange beef is shown with one dot, but it was not at all spicy, not even a little. I would assume that you can order items and request that the spice level be adjusted higher or lower than what is shown on the menu. In the case of orange beef, if you like it at least a little spicy, I suggest doing so. An enjoyable gathering as always. The company is as much fun as the food. My reaction to Peppercorns was good but not great. First, I was expecting more heat. It was ample but nothing was overwhelmingly fiery. Don't know if it was tamed for the tastes of some suburbanites, but it makes this a good place to take your more timid friends provided they don't insist on crab rangoon! I enjoyed most of the dishes but there was no one standout, though I certainly liked the MaPo tofu which is unusual for me as I'm not a tofu fan. However, all the flavors in the dish combined well. I also quite liked the pork lip which had a nice chew. The walnut shrimp was very mild, but the shrimp were good-sized and tender. Another mild dish, the pea shoot with garlic worked very well perhaps because of the contrast with the hotter dishes. I think it could be ordered without garlic, but felt it was definitely better with garlic. 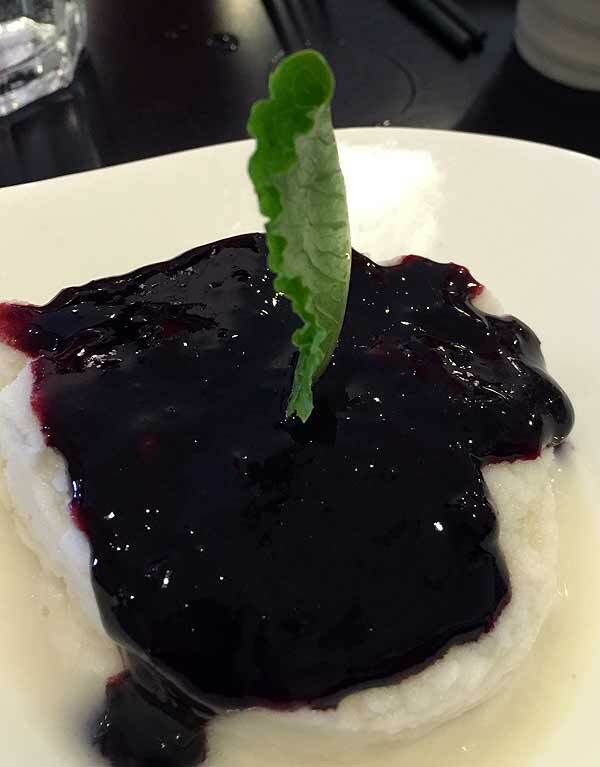 The yam with blueberry was an appetizer, but it was sweet and I think it would work as a dessert after having spicy dishes. The popcorn chicken didn't do much for me, the crunchy chicken bits didn't seem to have much flavor. The dry pot chicken was tastier. I won't repeat what others have already said about the remaining dishes which were all good. George R wrote: I was expecting more heat. It was ample but nothing was overwhelmingly fiery. I thought the popcorn chicken was very spicy. Note, this was the only "three dot" dish we ordered. And I'm not sure whether any of the dishes we ordered were designated with two dots. As usual with our large groups, we tend to order a variety of dishes, with a variety of main ingredients and a variety of spice levels. I want to put a good word in for Peppercorns Kitchen. 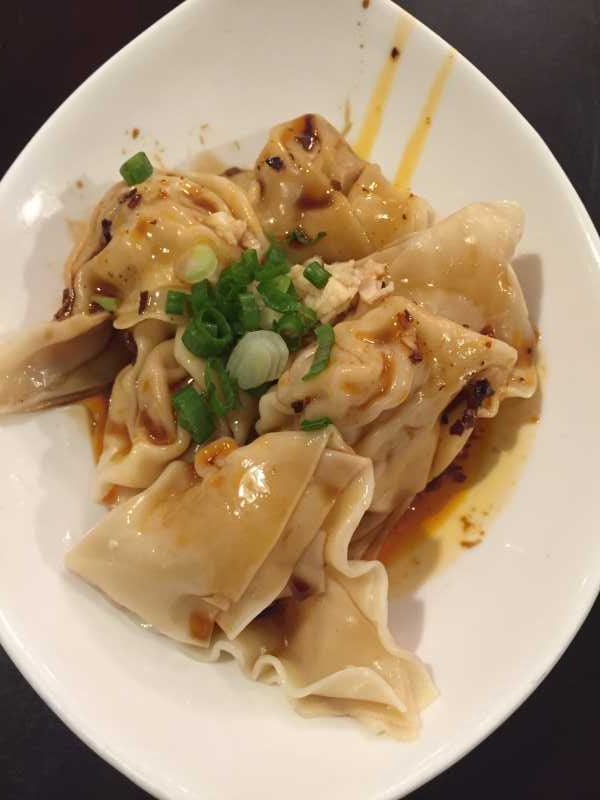 We have been choosing it lately over Lao Szechuan in Evanston when we want spicy Chinese take-out. They have a large menu, so not everything is equally wonderful, and we have barely tried a small portion of the choices. 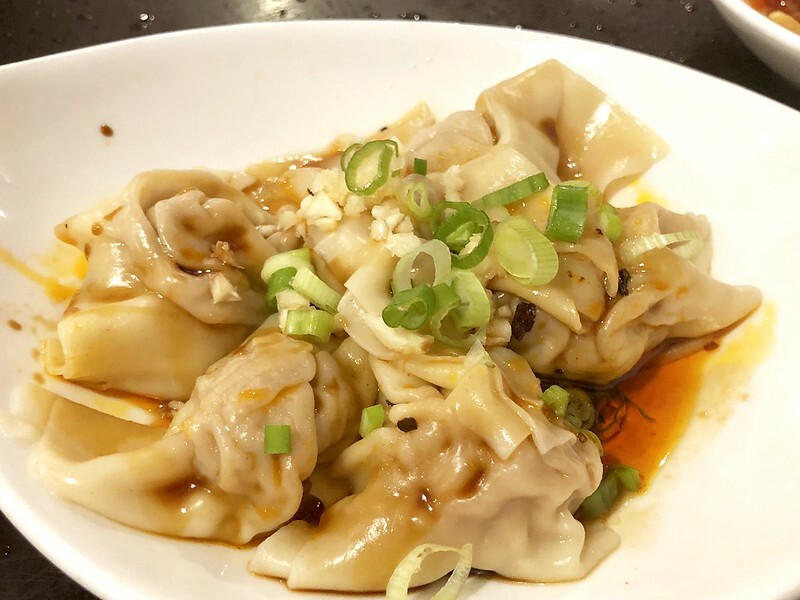 The core of the menu is Szechuan, but they also do some Northern (Xinjiang) foods, as well as Chinese-American standbys such as potstickers, wonton soup, kung pao preparations, and the like. --The pork lip with chili pepper discussed above is still a winner in my book--chewy, Szechuan peppercorn spicy, bright with cilantro. --Xinjiang style sauteed lamb is thinly sliced, boneless lamb coated with cumin, pepper of some sort, and other spices, along with onion. There is also a cumin lamb dish on the menu that we need to compare to this one, but the Xinjiang style was delicious. --PK does a nice job with basic vegetable preparations; we have enjoyed pea shoots, green beans (a bit wrinkly but tasty), and bok choy with shiitakes. --Tea-smoked duck (in the Chef's Specials section) comes as small hacked pieces and was moist and delicately smoky, if that's not a contradiction in terms. --Wonton soup, believe it or not. To us, a Chinese meal almost always includes soup. PK's hot and sour soup is a disappointment. While it brings the sour and hot, it is somehow bland and contains no meat. The wonton soup has lots of big meat-stuffed wontons, noodles, carrot strips, and woodear mushrooms. Add a little chili oil for heat if you like (I do). We are always looking to expand our selection of places to order in for our home "movie nights." Their menu and the reviews are enticing but I cannot find any indication whether they deliver. Does anyone happen to know the answer? (Or do I need to call and ask?) Thanks. Addendum: after extensive searching, it seems (I'm still not completely certain) that the restaurant itself does not offer delivery. Their food does, however, seem to be available through grubhub. Gypsy Boy wrote: We are always looking to expand our selection of places to order in for our home "movie nights." Their menu and the reviews are enticing but I cannot find any indication whether they deliver. Does anyone happen to know the answer? (Or do I need to call and ask?) Thanks. Grubhub IS the restaurant's delivery--that's just a consolidator site to access places that deliver and for which the restaurants pay dearly for the privilege. If a place delivers via Grubhub, they almost always take phone orders and appreciate those who call them directly since they keep all of the money from the order. It would be very hard to order carryout or get there for pickup or dine in. The phone number on the home page is 450-312-7624 which is in Terrebonne Quebec. The address given has a zip code of 60670- The First National Bank building. Thanks, both. Guess we'll just call the restaurant. It may take a while for delivery from Quebec, I'm guessing. They seem to have mastered the ancient Chinese secret of controlling time and space, so I wouldn't worry about it. I was delighted with a recent meal at Peppercorns. Roasted oolong milk tea with pearl was actually brewed and not reconstituted. Twice-cooked (twice-fried) pork had high quality preserved black beans, sliced large garlic, and tender leeks. Hot & sour soup was dark and rich with white pepper and bamboo strips at the ideal level of tang (though no meet as noted above). Every table around us was full, and with giant varied containers of hot pots, dry and with soup. It also smelled glorious - reasonably ventilated but toasted spices wafting in on plates from the kitchen. I'm a particular fan of Chinese lunch specials, and I note that their $8-and-under offering M-F includes some non-Westernized plates (RIP Spring World). I had a craving for Shui zhu niu rou so I tried it last night. The waitress made sure I knew it was spicy, I asked for 4 chili level and got a decently warming bowl. The pork belly in fresh garlic was very good; a rustic presentation with rough cut scallion and cilantro gave it a herb forward taste and plenty of Sichuan peppercorns but dialed back on the heat was a good counterpoint to the beef. Peppercorns Kitchen, Count me a Fan! Terrific version of one of my favorite dishes, Mapo tofu. Wonton in chili sauce were solid, reminiscent of Bite of Szechuan's (RIP) version. Had a nice lunch here this week, with the stand-out dish being the Dan Dan Noodles . . . The provenance of the noodles was dubious but the topping, a relatively dry prep, was tasty, fiery and pickle-y. Really good stuff. ronnie_suburban wrote: Had a nice lunch here ... the stand-out dish being the Dan Dan Noodles . . . I too had their Dan Dan within the last couple weeks and agree with your analysis nearly word-for-word. The flavor and lack of oily/saucy-ness are spot-on, but this was a case against vermicelli. The texture was completely lacking. As typical of angel hair, too soft, a spoon cuts through it. And still better than most. Highlight IMO was cold app "House Special Chicken w/ Sesame Sauce". Good rendition of Bon Bon. 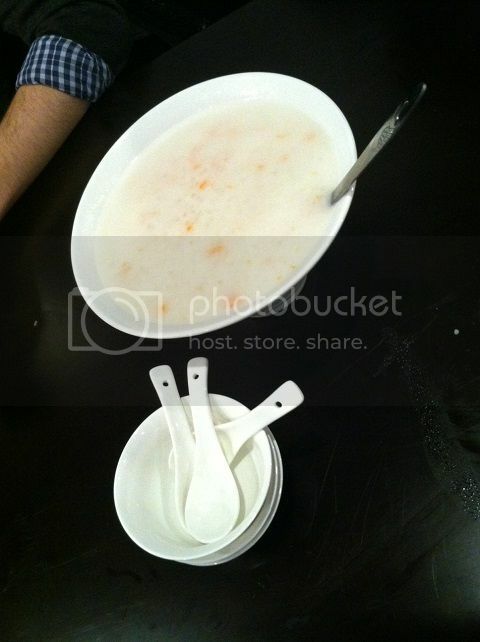 With the arrival of the cold weather yesterday we decided to go to Peppercorns to split one of their big bowls of soup. There are quite a few on the menu. We went with the Fish Filet in Green Peppercorn Broth. With a green peppercorn broth we were expecting it to be Ma - this, however, was more Ma than anything I have had before. Have to believe that this soup was, thankfully, not watered down or adapted for us. Dozens and dozens of green peppercorns floating on the surface of this soup. If you want peppercorns, this soup delivers. Peppercorns' version has a thicker, more substantial broth and not as many hot peppers and seemed to have even more green peppercorns. I would order this soup again as part of a larger group where we could each enjoy a smaller portion. It was a very good soup, but a lot of Ma to split between two people. bw77 wrote: We went with the Fish Filet in Green Peppercorn Broth. With a green peppercorn broth we were expecting it to be Ma - this, however, was more Ma than anything I have had before. Have to believe that this soup was, thankfully, not watered down or adapted for us. Happy to hear Peppercorns Kitchen delivered the Ma! Between Family House, Pakeeza and the much lamented Bite of Sezchuan I get a bit jumpy when I see one of my favorites pop up on LTHForum. Now that students are back at NU, they had a pretty full house on a Thursday night. Remiss in not posting about my meal with several others some months ago, but I enjoyed this meal more than I have enjoyed many other similar places, including MCCB. Beef & maw - delicious, good texture (I hate it when it's too chewy), well seasoned and spicy, but not spicy enough where those who are more spice averse would be turned off. This was one of the best versions I've had of this dish. Sliced pork belly with fresh garlic sauce - very good for sure, but there were several other dishes I much preferred. Wood ear mushroom salad - this was fantastic too. Great sauce, well cooked mushrooms and I loved the herbal brightness from the cilantro. Another must order in my opinion. Wontons in chile sauce - these were tasty; they almost always are. But I found the heat level to have been dialed back a bit much for me. So the filling was tasty but I prefer them to be a little spicier. 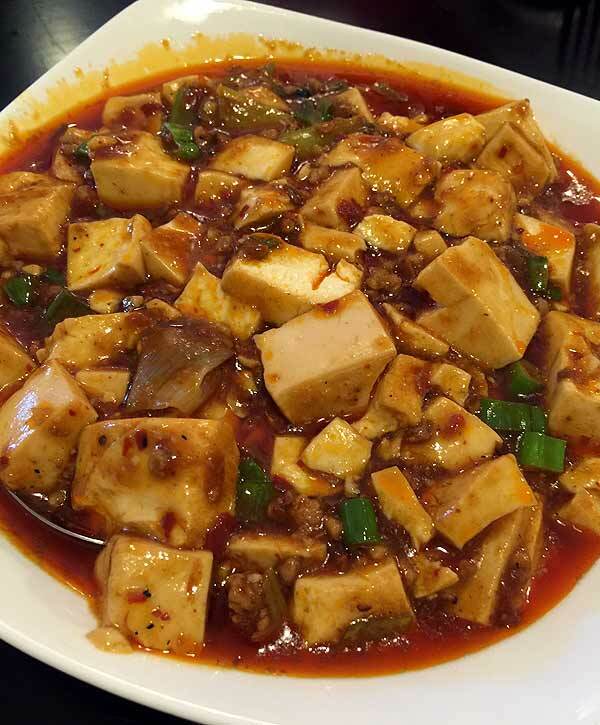 Mapa tofu - a really solid version; silky tofu, a delicious, vibrant sauce. I would have liked it a little spicier, perhaps just a bit, but this is one of the better versions in town I think. 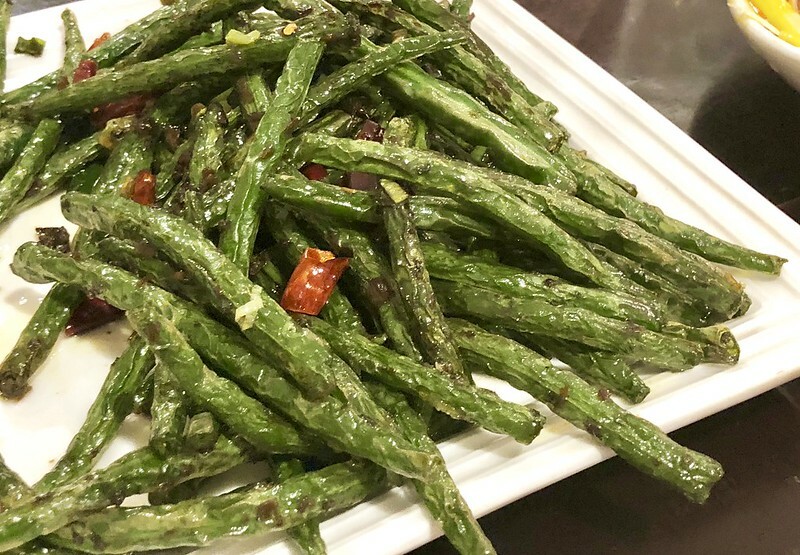 Sauteed green beans - very tasty, pretty decent char on the beans. 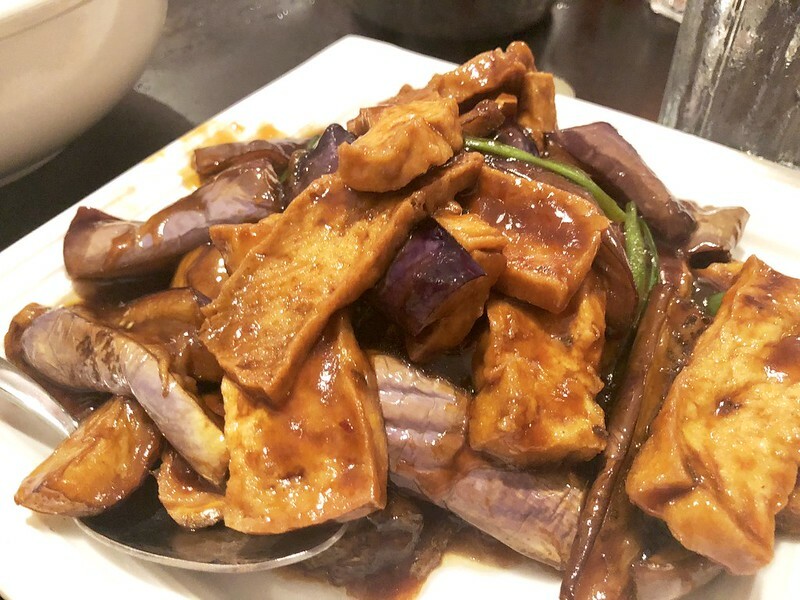 Eggplant with tofu I think - pretty mediocre; a bit of a sweet sauce, and nothing texturally to stimulate the tongue. 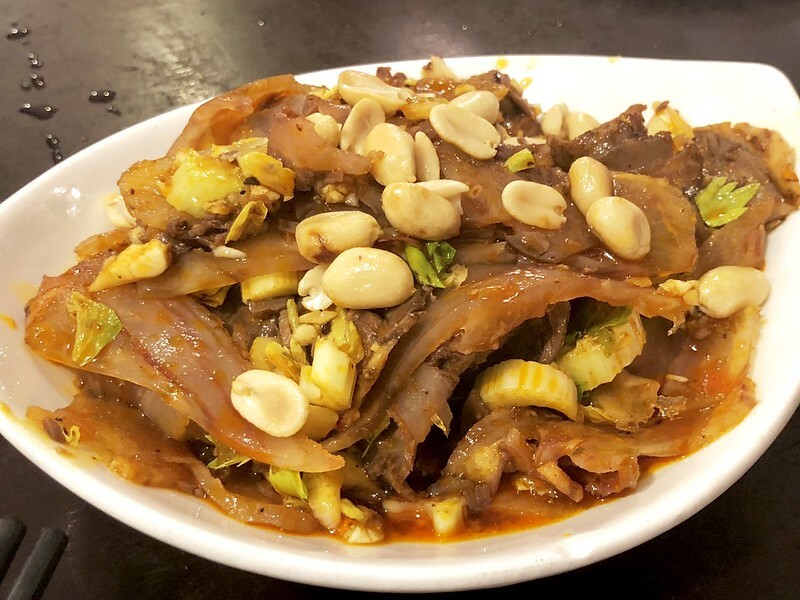 I love a good, crispy eggplant dish like the one I fondly recall at Lao Hunan, but I can't see this dish pleasing anyone very much - unless you like mushy eggplant with a slightly sweet flavor and little else. Frog hot pot - this was fantastic! Terrific flavor, nice heat. There are some bones to work through if I recall correctly but this was a great dish. 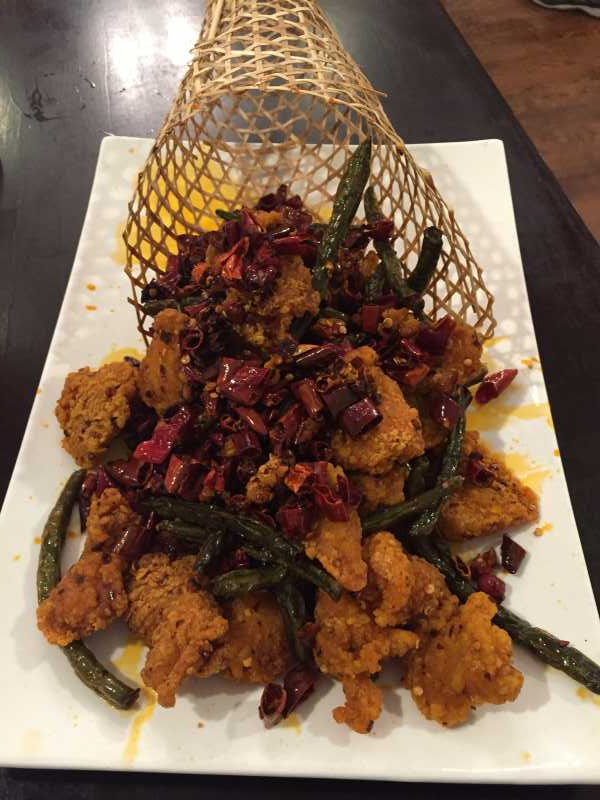 Chongqing popcorn chicken - I think others preferred this dish more than I did. The flavor was certainly there, and so was the crispiness. And it delivered some heat and some smokiness from the peppers. But I found too many pieces seemed like just crisp, without underlying chicken meat. I still enjoyed it, but the best versions I've had back in the day at LSC were better. Fried fish fillet - pretty much the same flavors as the Chongqing chicken, but there was plenty of meat to the fish so I slightly preferred the fish to the chicken (nice presentation too). But . . . don't order both if you want a variety of flavors. Extra spicy braised lamb - some serious Szechuan peppercorn zing here, and really great flavor. The lamb itself was a tad stringy and lacking a strong lamb flavor, but I loved every other flavor in this dish so much. And I loved how the glass noodles (hiding within the dish, though you can see a couple peeking through) picked up all of the flavor. This dish was great even with unimpressive lamb -- perhaps my favorite item of the night. Shredded pork with bamboo shoots - ho hum. Put this in the same category as the eggplant, though perhaps I enjoyed this just a little bit more. 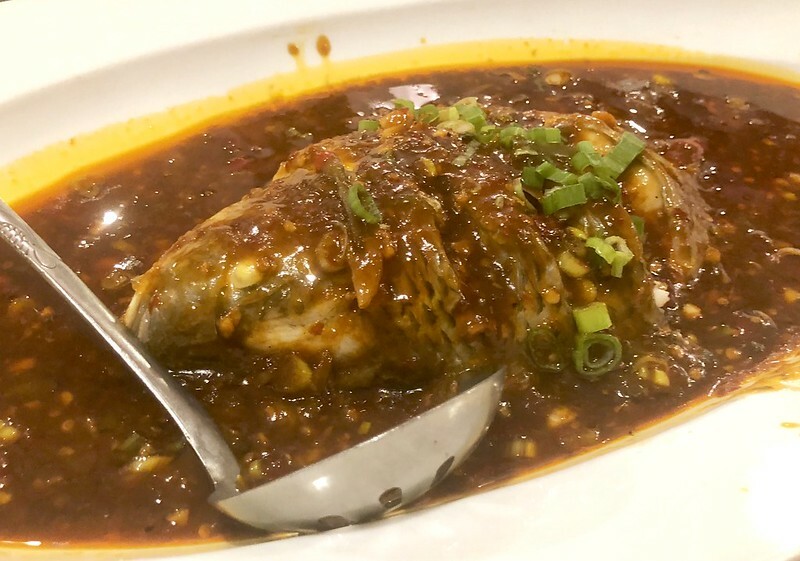 Whole fish with spicy soy bean paste - Not spicy and not so meaty with little in the way of texture. It was just okay overall - I'd rank slightly ahead of the pork with bamboo shoots but I probably wouldn't recommend it. Overall though, some really good food and the highs far outweighed the mediocre. Though I have not been back since my first visit, I am craving a return. I showed up without a reservation on the Friday after Thanksgiving and the place was jammed. After about a 20 minute wait, a table opened up, and service was incredibly fast and friendly. I could not believe how quickly my food came out. The waitress steered me towards Chengdu Dumplings, and Fried Fish Filet with Chili Peppers. The flavors of both were excellent, but now I want to go back with a group to explore the more exotic portions of the menu and chalkboard specials. The wine list makes no sense with the food they are serving, but to their credit, three sakes are on offer. Off dry Sake works very well.